Jean Kazez: Should We Aim for Extinction? The book/movie will be exciting and thought-provoking. How much should we trust those brainy ethicists whose arguments normal people can barely understand? How much should we trust our gut feelings? That's the "meta" question Benatar's book raises for me. But what about "the error" Signourney will discover? More work needed... But here's what I'm thinking about. 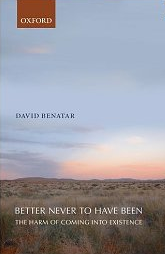 The pivotal claim in Benatar's argument has to do with an asymmetry. Absent pain is good, even if no one's experiencing the absence. Absent pleasure isn't bad; it would take someone missing it for it to be bad. (I summarize the rest of the argument here.) You can test out your intuitions about this by thinking about an empty place, say Mars, or an empty island. It will be prejudicial if you imagine dangerously high populations nearby, so don't make the island right off Mumbai, and you may want to picture Mars in a lonelier universe than ours. The more I think about it, the more I think zero has to be the right number for the absent pain on Mars--a positive number won't do. This is clear when you consider that it's impossible to pick a number. Are all pains absent from Mars? Or all possible pains absent? Mars is certainly better than Earth, painwise, but that's fully represented by giving Earth a large negative number for pain and Mars a zero for pain's absence. From my informants' standpoint, it's also OK to say (symetrically) that Earth is better than Mars, pleasurewise. There the score is a large positive number to zero. If no asymmetry, then no call for extinction. This is what Sigourney is going to argue, at the 11th hour. Baffling. Absent pain, I gather, is possible, non-actual, pain. But ow much pain might there have been? Undeniably, an infinitely large amount, since surely there might have been infinitely many (more) people suffering a bit. So every possible world is infinitely valuable (given all the pain that does not obtain) and that washes out the differences in their positive value. I take that to be a reductio of this strange view. That does seem like a reductio to me. I'm curious how Benatar would respond, or if he's responded to a similar objection in print. What if we put in other terms? Instead of contrasting pain and absence of pain, we contrast life and non-life. I think that most people would opt for life, even though life contains pain and suffering. By the way, reducing human life to pain and pleasure is an extraordinarily reductionist view of human existence. In human existence, inspite of the pain, most of us have projects, try to achieve things, try to construct (or destroy things), try to communicate with others, try to formulate philosophical arguments, etc., etc. You are probably familiar with the Voluntary Human Extinction Movement. VHEMT is predicated on the idea that it's better for the planet that we don't exist and we should do the right thing: live long and die out. That's not the same as Benatar's reason. "The idea we need seems to be that of life which is ordinary human life in the following respects -- that it contains a minimum of basic human goods. What is ordinary in human life -- even in very hard lives -- is that a man is not driven to work far beyond his capacity; that he has the support of a family or community; that he can more or less satisfy his hunger; that he has hopes for the future; that he can lie down to rest at night." Does that make sense? I'm not sure, but there's something worth pondering there. That does seem like a reductio to me. I do find it absurd, but Benatar's a smart guy, so I'm trying to think what his response would be. exist if their lives would be utterly miserable. my intuition tells me: we strive to behave in the best possible way. 2) I can say an action is "bad" if I see that there was at least one better alternative. So, we cannot accept the murderer that says "hey I just killed one person, I'm a good guy, I could have killed ten instead! ", but we do condemn him if we can see that he could have killed nobody instead. So, yes, we can imagine infinite worlds in worse situations, but that is not a strong argument to say that this is a good one. And Benatar's asymmetry is caused by the "existence" vs "non existence" asymmetry, I don't think the same argument could be made for generic "possible non-actual pain". This sounds a little like the movie/book Children of Men. Very true--that's an interesting movie.